The National Retail Federation Foundation (NRF Foundation) is committed to shaping retail’s future by demonstrating retail as an industry of opportunity. Through providing valuable resources and experiences, they prepare people for jobs that, in turn, lead to promising careers. The NRF Foundation began to examine how to grow their training programs. 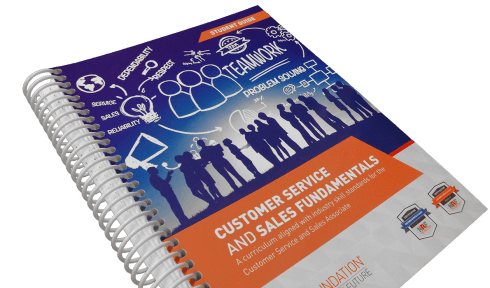 At the time, NRF’s Customer Service and Sales certification material was available from two different course books, which created confusion for participants purchasing the material. The first book, developed and owned by NRF, did not provide an optimal experience for instructors and learners. The student book did not match the instructor’s, making classroom discussion difficult, and did not provide the opportunity for self-study that students were asking for. The second book, developed by a third party, hadn’t been updated in nearly ten years. NRF decided to focus on their own book, making significant changes to the structure and design. Their main three objectives were to re-write the book, ensure core content matches between instructor and student, and implement design and print quality that enhances the material. NRF reached out to Omnipress with a very specific vision of what the organization wanted to achieve: take their vision and apply it across both books in a way that not only looked impressive, but facilitated learning. Initial response to the new books was extremely positive. Not only are the books “beautiful,” but the student textbook, with its more robust content, allows learners to choose to self-study or join an instructor-led session. Allowing Omnipress to manage the entire process — design, formatting, printing, and order fulfillment — simplified and streamlined the entire project, allowing staff to spend more time on program development.